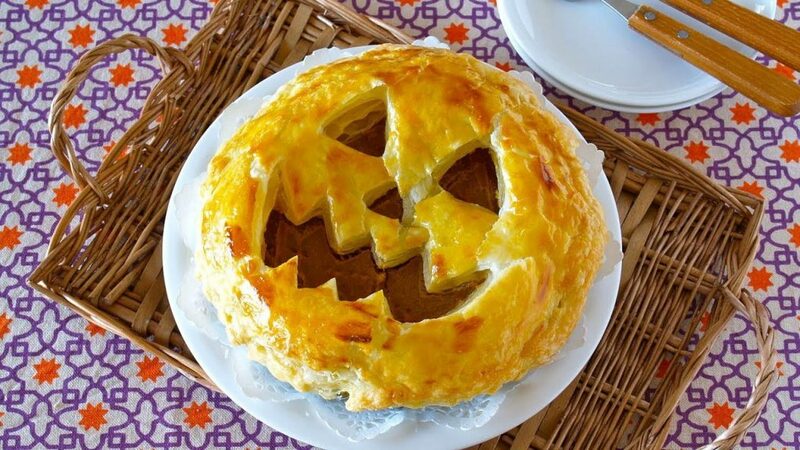 Who does not love Halloween? The festival means spooky decorations and funky costumes, and its arrival means Christmas is just around the corner! There is nothing to freak about if you are away from home this year. 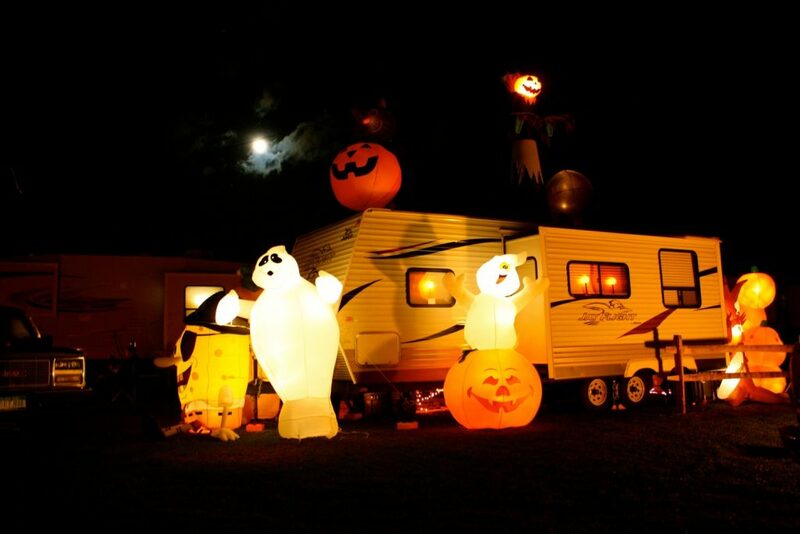 There are loads of Halloween camping decorations that will bring all the ghostly spirits to your RV and the campsite. Don’t worry if you have decided to leave town for a camping weekend over the holiday. It is never too late to add some eerie camping decorations. RV-ing is a popular trend in America and numerous families love to spend the holidays away from home, in a remote campsite. But, that does not mean that you cannot bring the festivities along the ride. You can create a Goblin Graveyard or a Gate of Frankenstein in the campsite. Seem too much work? Well, the simple tasks like carving a pumpkin or filling up the campsite with motion-activated props are also great Halloween camping ideas. These kid-friendly Halloween camping decorations will spook up your RV, campsite, or tent that adults will love too. 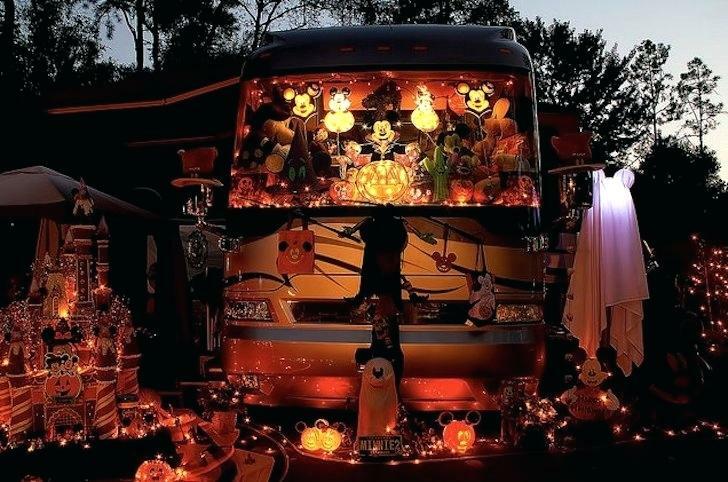 One of the easiest camping decorations for RV to bring the Halloween spirit. Decals with weird and scary images imprinted on them are sold everywhere during this holiday season. Just go to a store or order online. If you are a DIY lover, try to make them by yourself. You will just need black poster paper, scissors, and double-sided tape. It will be more fun if you have kids. Halloween lights are available everywhere. You will find them in practically any retail store. 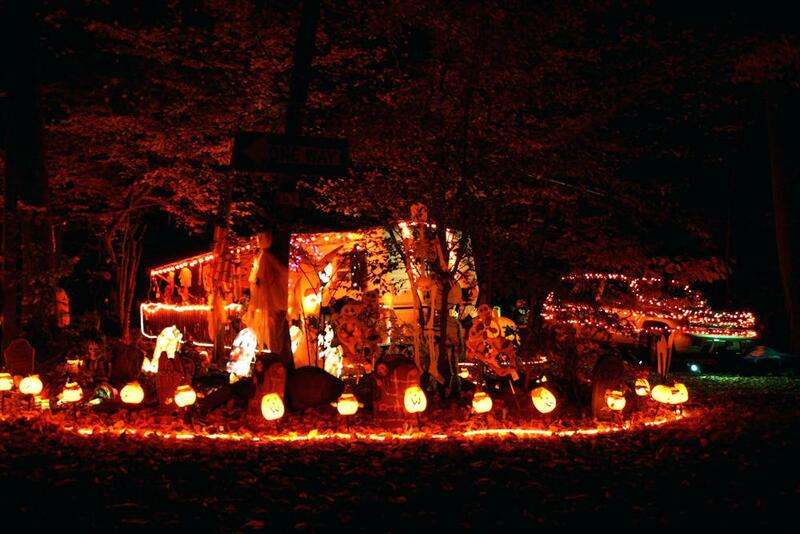 The string lights are the best option for Halloween camping decorations. Hang them any way you want and you can make various scary shapes with them like ghosts, owls, skeletons, and more. You can also decorate the awning with the string lights. Inflatable solar lights and lanterns are also good choices for spooking up the campsite. They come in various shapes like spiders, ghosts, pumpkins, and more. Blow them up like beach balls and deck the RV and its surroundings for fun. Plus, these solar lights are eco-friendly. There is no hassle of plugging them into an electrical outlet or sending extra money on batteries. Carving pumpkins in the Halloween will never get old. It is one of those crafts that kids and adults can do together (be aware of the sharp tools, though). Don’t have any artistic talent? Don’t worry. You will get pumpkin carving kit with pop-out stencils in the stores. Purchase a couple of them and carve pumpkins with your friends or family like a boss! Let your dark imagination and sinister Halloween fantasies run wild! There is no lack of spooky props and you will find them easily in any retail store. Purchase props of scarecrows, skeletons, skulls, monsters, tombstones, and anything else you can think of capable of creating an uncanny impression. 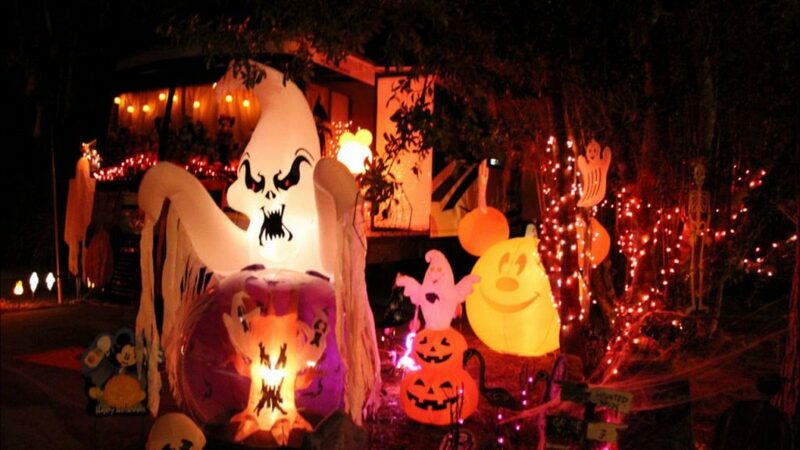 Make it scary with assorted decorations. 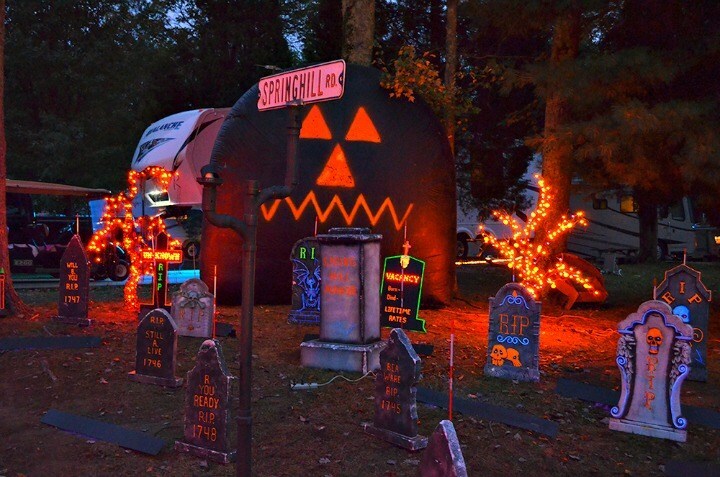 Some campgrounds announce their own site decorating contests for the Halloween. Participate and impress everyone else with your unique campsite Halloween decorating ideas. Even if you are not a highly creative soul, it will still be fun. Having a Halloween-themed dinner party is very traditional. You are probably busy finalizing the menu but what about the table decoration? Don’t you want the dinner table to give a chilling vibe when everyone is having a mouthful of those spider grilled cheese or witch finger breadsticks? You can use a bright-colored or a themed table cover. A kid’s activity tablecloth featuring games or puzzles will be a lifesaver if you have kids. 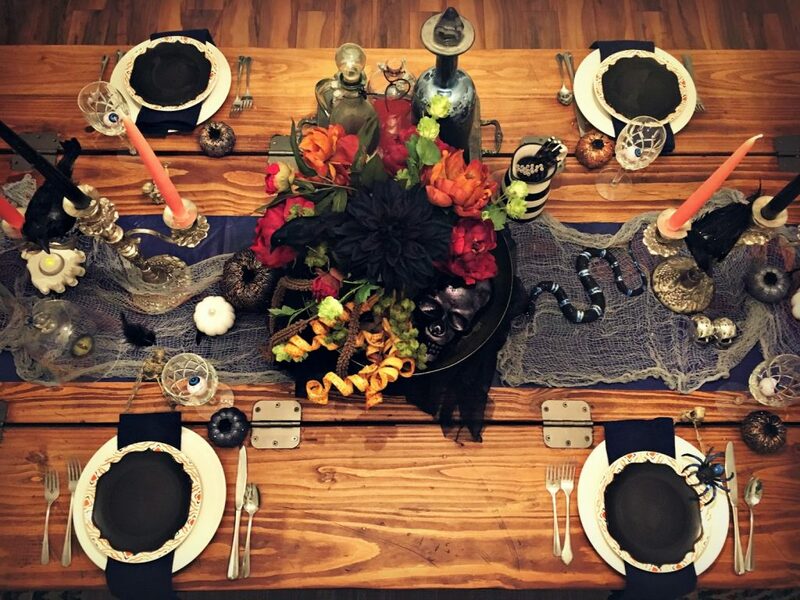 Halloween-themed plates, forks, spoons, cups, napkins, and other things will turn an ordinary dinner table into a dining space for Dracula or something even scarier. You can easily find skull spoons, skeleton hand salad server, grim reaper salt and pepper shaker, and other similar things. 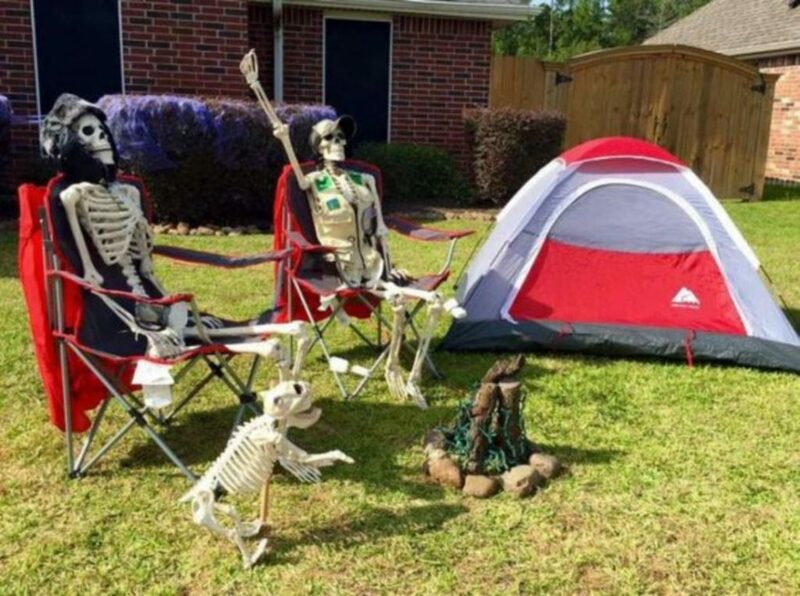 These Halloween camping decorations will certainly amuse your guests. Frightening up the table will not be enough if you forget about the small details like the kitchen towels, chopping boards, and a few other things. When you are bringing those creepy food ideas to life, why not make them even scarier with some small details. How about a brain-shaped ice mold? Your guests will definitely love to have a drink with frozen brain ice cubes in it. Cute (?) 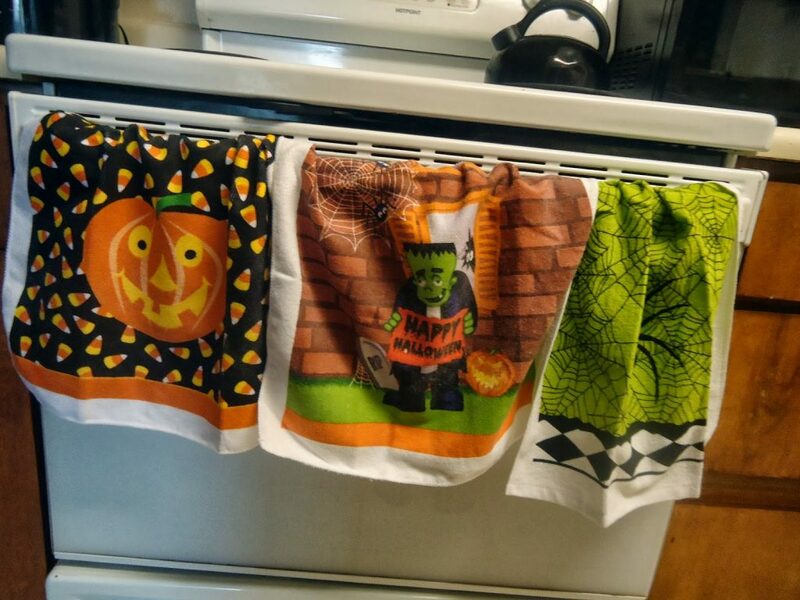 Halloween kitchen towels. You can also think about adding a blood-splash chopping board and witch or spider-printed kitchen towels to add to the kitchen decoration. They will serve the double duty of completing your Halloween camping decorations and being something that you will actually use even when the holiday is over. 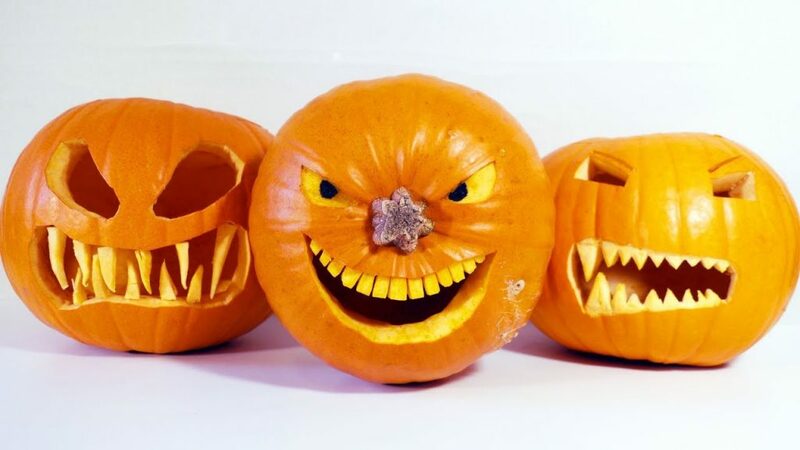 Apart from carving or turning them into jack-o’-lanterns, you can also use them for other purposes. How about a making a drinks cooler out of a pumpkin? Just hollow it out, fill with ice, and place it on the table with the bottles inside. Make a pie with the innards. Don’t throw away the pumpkin innards. Make puree to use in a pumpkin pie and roast the seeds for delicious snacks. You have planned to embellish the entire RV and the surrounding campsite, but what about the RV door? Leaving it bare does not go with the rest of the festive theme. 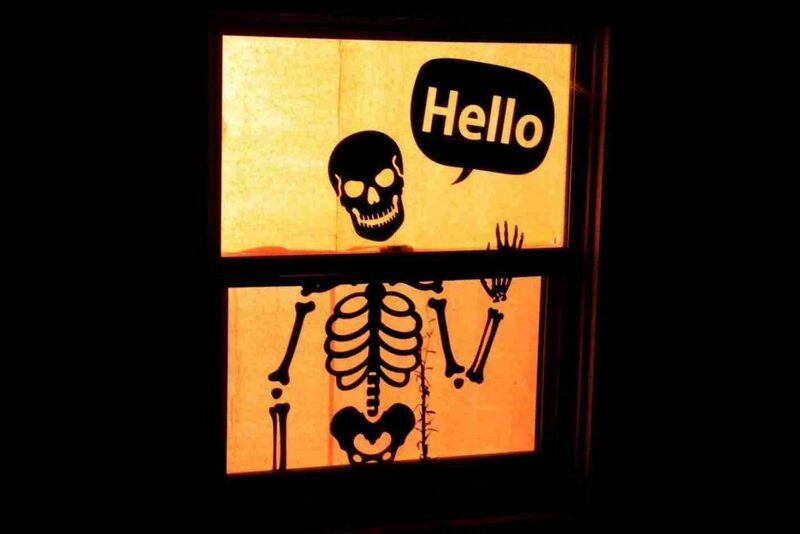 But, what could be the best way to greet the guests? You can use string lights or spooky banner and festoons. 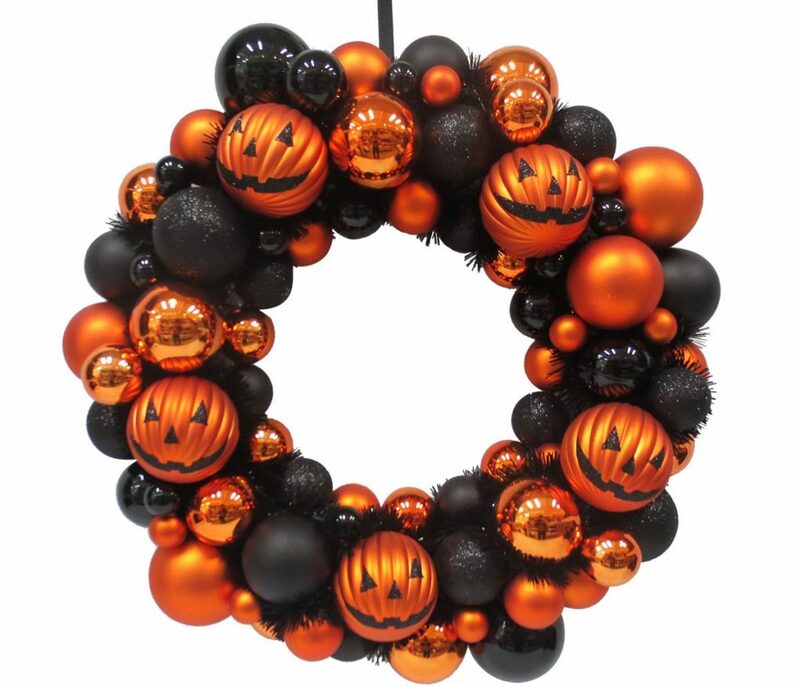 But, crafting a pumpkin wreath seems to be a nice idea if you are up for some DIY work. A pumpkin wreath for the RV door. The basic things required for the task like dried mini pumpkins, a wreath frame, glue gun, and other things are available in the stores. You can buy a wreath if there is not enough time to craft one. 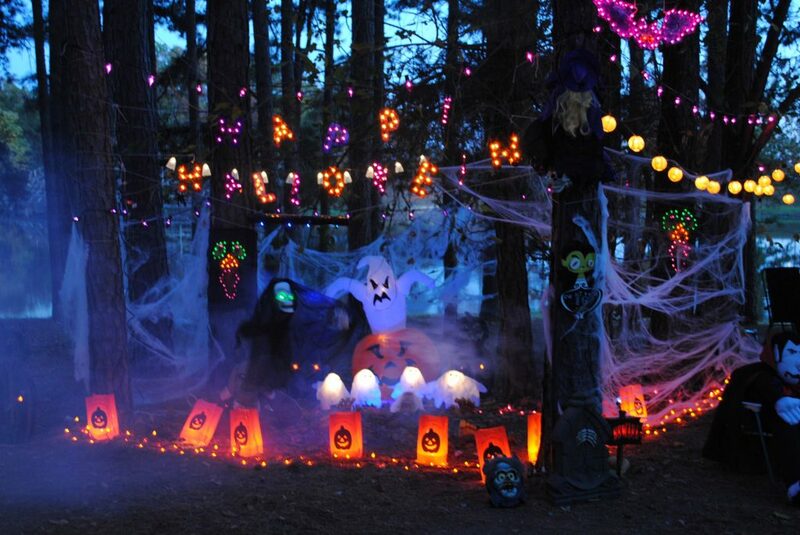 Many people fear Halloween camping decorations for budget and space problems. Fortunately, almost all of these ideas won’t cost you that much money. Also, you can use most of these items even when the festival is over. Top 5 Best Small Motorhomes For Campgrounds! Using Household DirecTV Receiver In RV: Is It Possible?